The home is a bright white color with a very long sundeck on the 2nd level. The living room of this beautiful home has two striped green and brown sofas of which one folds out to a bed. The room includes a built in brick trimmed fireplace, coffee table and a media stand. The media stand has a TV and DVD player. The room has windows all the way around which illuminate the area with natural light. The dining room has a long rectangular shaped table with seating for 8 guests. The room includes a buffet stand and art adorned walls. The kitchen has raised panel oak wood cabinets with gray laminate counter tops and white appliances. The kitchen is loaded with all the cookware and serving ware you will need to prepare a delicious home cooked meal. There is also a blender, toaster, coffee maker and mixer. The 1st bedroom has a queen size bed with a four poster wood frame and stripoed earth tone bedding. There are 2 lighted bed side tables and a dresser for clothing. The room has a corner window that lets the natural light brighten the room. The attached master bathroom has a sunken Jacuzzi bath tub with a walk in shower and double sink vanity. The 2nd bedroom has a double bed with a light blue paisley printed bed spread. The room has a lighted bed side table and beautiful art decorating the walls. The room has a view window and a large closet for your clothes. The 3rd bedroom has two double beds with matching lavender colored bedding. The room includes a bed side table with a lamp and several gold trimmed wall mounted art pieces. The room has a view window and a large closet for your clothes. The 2nd bathroom has a single mirrored sink vanity with a commode and walk in shower. The 4th bedroom has a double bed with a matching furniture suite and closet. The home has a sundeck that wraps around the entire top of the home. You could have a cold beer or frozen daquirir and walk upstairs to watch the sunset over the Sea of Cortez. 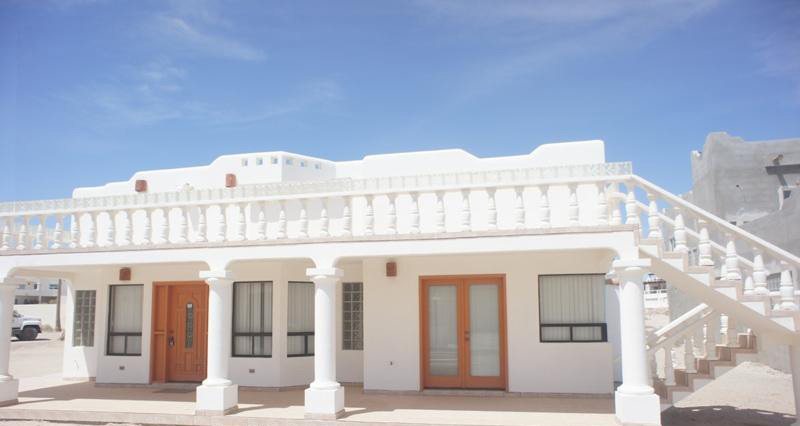 This home is not beach front but does have a beautiful view of the Sea of Cortez from its roof top deck. This home is located on the back row of the development which makes it a pretty easy walk to the beach where you can swim, have a picnic, collect sea shells or bathe in the sun. This would be an ideal home for a large family or for a big group of friends. You can breathe in the salty ocean air and listen to the sounds of the tide rolling in and out. You will not be disappointed with the comfort and amenities in this Playa La Jolla home. 07/08/13 02:01pm Mike See # 14. Please send your exterminator this week before our renters arrive on Thursday, July 11, 2013 to treat for mice and cockeroaches etc. Thanks.